Inside the redesigned Galaxy S8 and S8+ is either a Qualcomm Snapdragon 835 or Samsung Exynos 8895 SoC. The US and other regions that require CDMA capability will get the Snapdragon 835. We already have some idea of what to expect from the 4x4 big.LITTLE Kryo 280 CPU and upgraded Adreno 540 GPU after some preliminary performance testing. We know less about the Exynos 8895, which the rest of the world will receive. When we spoke with Samsung LSI at MWC 2017, a representative told us that while the 8895 comes with a Mali-G71MP20 GPU, the GPU configuration and operating points are set by the OEM, meaning it’s possible the S8 will not use all 20 GPU cores. The new SoCs are paired with 4GB of LPDDR4 RAM, the same amount that’s in the Galaxy S7, S7 edge, and most other flagship phones. Internal storage is limited to 64GB with the option to add additional capacity via microSD card. While this will be enough to satisfy most people, it would be nice to see a 128GB option for a flagship in this price bracket. Even though overall size and thickness have increased slightly compared to the previous generation, battery capacity has not improved. The Galaxy S8 comes with a 3000mAh battery, the same size as the Galaxy S7, while the S8+ comes with a 3500mAh battery, slightly less than the S7 edge’s 3600mAh capacity. It will be interesting to see how battery life compares, considering the S8s’ larger screens contain nearly 16% more pixels, increasing power consumption if not offset by panel efficiency improvements or power savings elsewhere, such as the new 10nm SoCs. Regardless, it’s disappointing that Samsung is still prioritizing thickness over battery life. The overall camera experience has been a differentiating feature for the past couple of Galaxy generations. 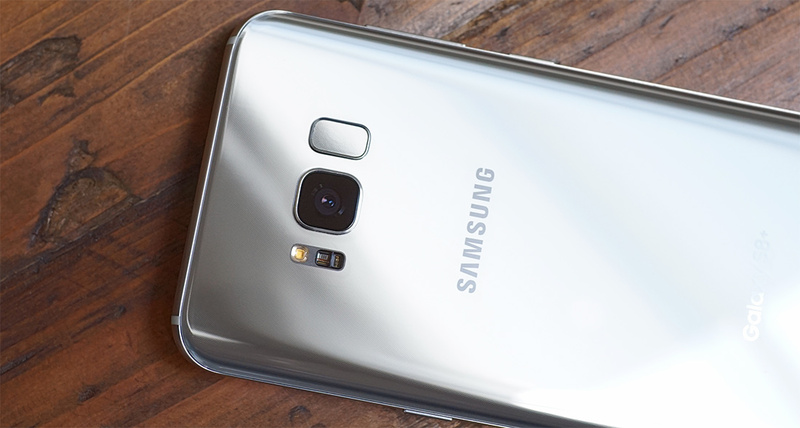 Samsung gave the S7 and S7 edge a new 12MP rear camera last year that improved low-light image quality. It was also the first phone camera to use dual-pixel PDAF, which vastly improves autofocus performance by using every pixel for phase detection instead of just a handful of phase detection pixels scattered across the sensor. 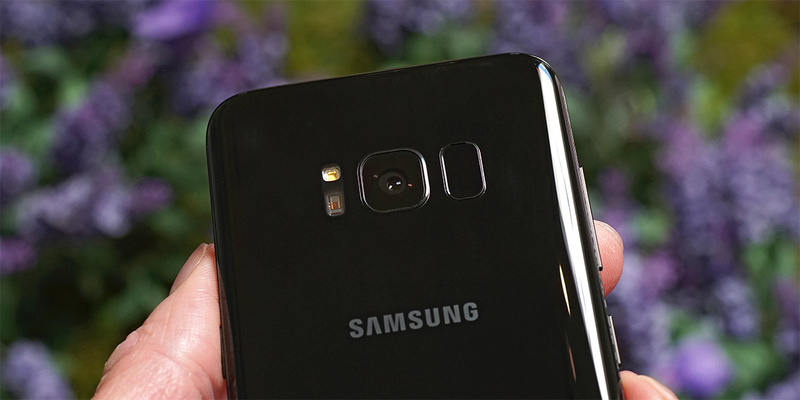 While most flagships—and even some mid-range phones—are moving to dual-cameras and adding hybrid AF systems to improve performance and attract consumers’ attention, Samsung is content to reuse the S7’s rear camera for the S8 and S8+ but with updated image processing software. We’ve grown accustomed to seeing a new camera every year, but the S7’s (and now S8’s) camera is still among the best available for phones. Its combination of features (object-tracking AF, auto HDR, HDR live preview, manual mode, 2160p30/1080p60 video), quick performance (camera launch, image capture, AF, HDR processing), and excellent image quality add up to a great overall camera experience. Adding a second sensor could enable additional features, such as depth sensing for bokeh effects, or further improve image quality, but Samsung is either not willing or ready to travel that path yet. The S8 and S8+ do get a new front-facing camera, however. The higher-resolution 8MP sensor is paired with a fast f/1.7 lens that’s capable of shooting up to QHD (2560x1440) video, although HDR, EIS, and video effects are deactivated in this mode. Samsung’s Smart AF feature uses face detection and contrast-based AF to improve image focus for selfies. 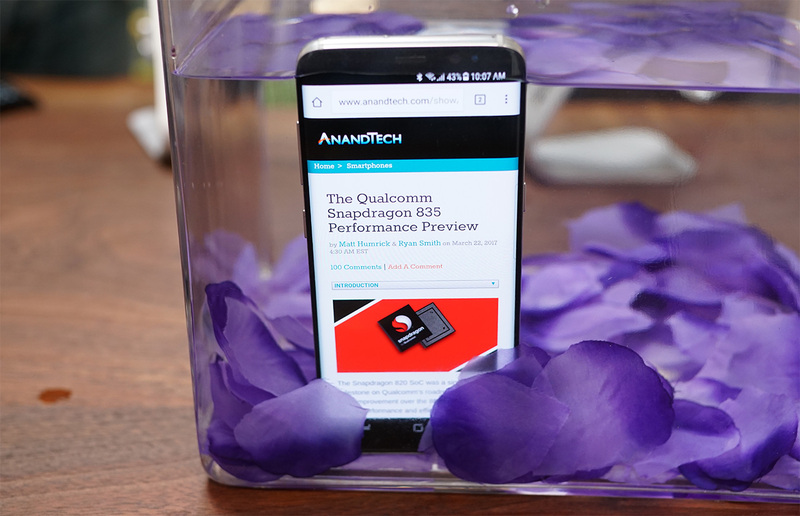 The Galaxy S8 and S8+ have an IP68 rating for water and dust resistance, so you can read AnandTech in the bath. The new Galaxy phones come with Android 7.0 and Google Assistant. TouchWiz gets a facelift with more rounded corners to match the screen, but the most interesting new software feature is Bixby, Samsung’s new virtual assistant. This “intelligent user interface” promises expanded voice navigation, allowing you to (eventually) substitute voice commands for any touch-based actions. It’s deeply integrated into the OS already, and Samsung has an SDK available for third-party developers. There’s more to Bixby then just telling your phone to adjust the screen brightness or open an app, however. Tapping the Bixby button in Samsung’s Camera app activates Bixby’s object recognition capabilities, allowing it to scan QR codes, process business cards, perform language translation, and provide product information and shopping links. It also learns your habits over time and provides context relevant information, reminders, and suggestions. For example, if you call your significant other on your drive home every day, Bixby will recognize this and offer to automatically dial his/her number for you. Bixby is still a work in progress, though, and it’s not clear how many of its features will be functional when the phones begin shipping. Samsung is also announcing some new accessories alongside the Galaxy S8 phones. There’s a new version of Gear VR that’s compatible with the S8, S7, S6, and Note5 families. First announced at MWC 2017, this new model comes bundled with a touchpad controller that also enables hand tracking. Samsung’s Gear 360 VR camera also gets a refresh. It’s now capable of recording 4096x2048 H.265 video at 24fps, a slight increase over the previous version’s 3840x1920 resolution at 30fps. Samsung's DeX docking station is a productivity-focused accessory that allows a Galaxy S8 phone to drive a desktop experience. The puck-shaped cradle includes an HDMI port, two USB 2.0 ports, and a 100Mbit/s Ethernet port for connecting the phone to an external monitor, keyboard, mouse, and wired network. The phone’s external speaker provides sound. 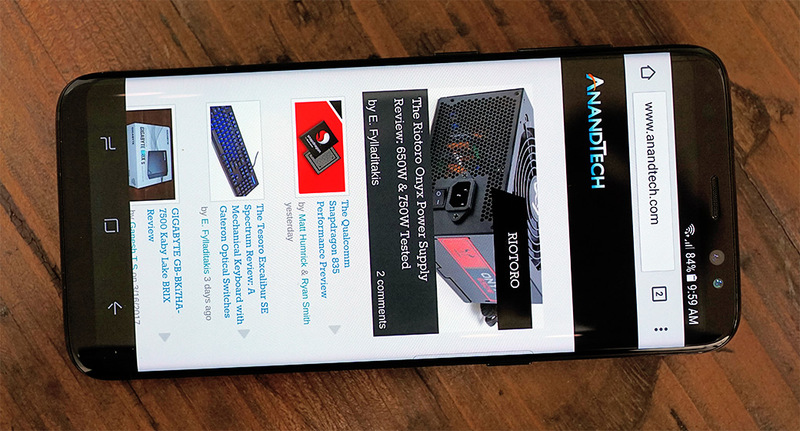 Instead of a stretched-out phone UI, the S8 provides a desktop environment with support for multiple, resizable windows, copy and paste between windows, and an app drawer for accessing all the Android apps installed on the phone. The Galaxy S8 and S8+ will be available in US stores beginning April 21 and will come with Harman AKG earbuds. Pre-orders will begin at 12am ET on March 30. As an additional incentive, customers who pre-order the S8 or S8+ will receive a Gear VR with Controller for free. There’s also a premium bundle that throws in a 256GB microSD card and AKG Bluetooth headphones for an additional $99. Colors for the US include Midnight Black, Orchid Gray, and Arctic Silver. Coral Blue and Maple Gold colors will also be available in select markets. In the US, the Galaxy S8 will retail for $750, while the S8+ will cost $850. The new Samsung Gear VR with Controller will also be available on April 21 for $129.99. The Controller can be purchased separately for $39.99.